Dixy Chicken in Holmeside. Picture by Google. Three customers caused almost £3,000 of damage when they were told the toilets at a Dixy Chicken shop were closed. Dylan Sanderson, 21, Nathan Howe, 22 and Jenna Horsman,18, became "aggressive" when they were told the facilities at the Holmeside shop in Sunderland had been locked two hours before their visit last September. During the trashing attack, Horsman caused irreparable damage to a till and Howe wrecked a counter top. Shocking CCTV footage of the incident showed furniture being thrown and terrified staff being spat at. Prosecutor Kevin Wardlaw told Newcastle Crown Court: "At around 9pm in the evening the defendants entered Dixy Chicken at Holmeside in Sunderland. "One of them asked if they could use the toilet. "It was pointed out the toilets were closed after seven, at which point someone said they would p*** on the floor. The court heard one shop worker told police he was left "shocked and shaken". Another said: "I didn't want them to come over the counter, there was a real fear they could use items to hurt me." The court heard £2,900 in damage was caused and the franchise owner said the loss would have an impact on his business. Judge Stephen Earl said the incident was "disgraceful, disgusting, despicable behaviour" which was "childish, immature and pathetic". Tony Cornberg, defending Sanderson, said: "That night five months ago was the last time he had any trouble and the last time he was in that state." Mr Cornberg said Sanderson has stopped drinking heavily and "is trying harder than he has ever tried" to find work. Andrew Finlay, defending Howe, said: "He doesn't remember a great deal about what happened. He remembers getting angry but little more. "He is horrified by what he has seen on the CCTV. " Mr Finlay said Howe has a good work record and references. Jamie Adams, defending Horsman, said the teenager had a troubled up bringing which left he with emotional problems and anger management issues but she is taking courses to improve her future. Mr Adams said Horsman is ashamed of her behaviour and described it herself as "diabolical". Sanderson, of Caspian Road, who was already on a suspended sentence, admitted affray and was sentenced to six months imprisonment suspended for 12 months with 121 days unpaid work. Howe, of Darlington Square admitted affray and criminal damage was sentenced to four months imprisonment suspended for 12 months the with rehabilitation requirements and 50 hours unpaid work. 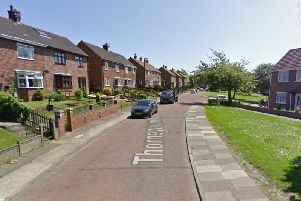 Horsman, of Springwell Road, all Sunderland, admitted affray and criminal damage and was sentenced to a community order for 12 months with rehabilitation requirements and 40 hours unpaid work.